Andamans has the charm and beauty of the highest order. This travel destination features at the topmost of any chart in a traveller’s to-do list. It has the right mix of everything the natural beauty, the beaches, the varied topography, the exotic limestone caves, the wild mangrove shelters, the pleasant sunshine, the warm coastal waters, the vibrant marine unwater life, the rich coral reefs and the warm. Smiling and always ready to help and down to earth local people to take care of your each and every need. There are various kinds of trips organized by tour and travel operators. The tour packages from Delhi like all other similar tours will typically include stay, flight and sigh-seeing. Detailed itinerary are chalked out and all requirements taken care of by the travel agents. The packages are booked after a close consultation with the clients. Keeping is view the individual choices and preferences, the stays, the sightseeing and the detailed travel itinerary is planned. The types of packages vary on the basis of destinations to be covered, the tastes and preferences of the travellers, the size of the group, inclusion or exclusion of flight fares and similar factors. In case you are travelling alone, you would not be worried much about the luxury and comfort and other typical needs. You would be a free and wandering soul flitting from one place to another. If you are travelling with family, you have to choose discreetly taking into consideration the typical needs of the family, the departure and arrival times, the places of stay, the basic comfort and facilities provided, also the surety of booking and the entire trip needs to be pre-planned. In case, you are travelling with toddlers or babies, the requirement stretches. The comfort level needs to be matched according to the needs of the babies and their specific requirements. In case you are travelling in a big group, you need to accommodate the various needs and schedules of the group members. You need to coordinate and match your timings with the group schedules. During the tour, there are certain rules and regulations that are generally followed by the tour and travel operators. In case any scheduled sightseeing or trip gets cancelled due to certain reasons, alternative sightseeing arrangements are usually arranged to compensate for the same. The tour prices generally vary for national and international tourists because international tourists have certain restrictions of movement and also the entry fee, etc. vary with nationality. For NRIs or foreign nationals, the tour price generally is more than nationals. The international tourists are advised to contact the booking operators for detailed price scheme. NRIs and foreign nationals might require Visa to travel to certain locations. For Andamans Visa is not required though. 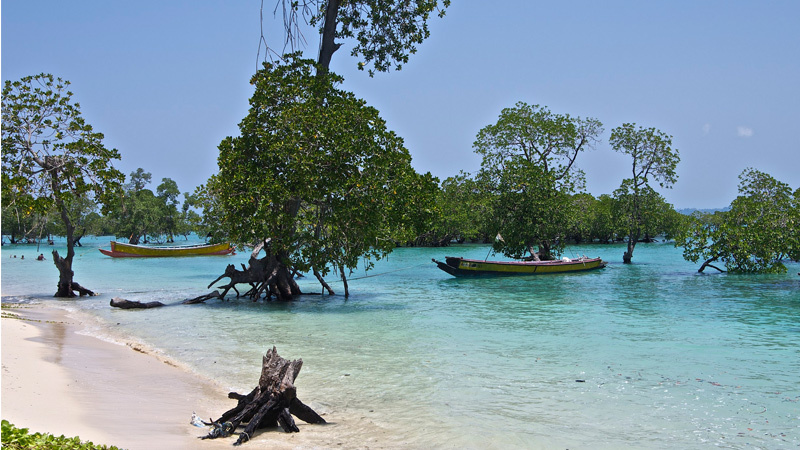 Andamans has several islands that are inhabited by rare and unique aborigines, who live a completely isolated and secluded life preserving their culture and civilization from the outside world since centuries. The Indian government and the military and navy together are committed towards protecting their originality and purity of race and culture. Foreign nationals and NRIs require special permit to visit certain areas/islands. In the monsoon month of June, July and August certain areas are inaccessible and ferries and boats stop plying. Most tour and travel operators and websites lay down the timings and inaccessibility probabilities. For example, Jolly Buoy Island In case of unfavourable weather conditions gets closed as it is prone to cyclonic destruction. In case of flights delays or other emergencies, the tour operator shall take care of the exigencies and shall take control of the situation facilitating the safe transit of the clients/guests. In case of certain unavoidable circumstances itineraries might be subjected to prior or last-minute changes but the changes shall be well informed to the travellers.